A good understanding of what can be done to modify the properties of steel is critical for being more productive and profitable. Steel types & designations used for the different categories of steel alloys. Metallurgical phases and microstructures found in steels and their effects on steel strength and hardness. How to use the iron-carbon phase diagram to predict the phases present in a steel alloy based on composition and temperature. Effects of cooling rate on the microstructure that forms when steel is quenched during through hardening heat treatment. Upon successful completion of the course you will receive a certificate for 3 credit hours (0.3 CEU’s). Basic knowledge of the following topics is required: solid solution, substitutions, interstitials, diffusion, effects of process temperature and time on diffusion and metallurgical changes, metallurgical phases, grains, grain boundaries, dislocations. 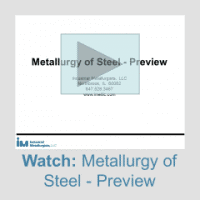 Our Principles of Metallurgy course teaches these topics.